Glenn has had to endure personal tragedy that nobody at such a young age should ever have to experience. His parents, Denise and Denis Scott, were killed in a motorcycle accident when Glenn was only 12 years old. Since that time Glenn has been raised by his older brother, Greg and sister, Candice. The three Scott children have stayed together as a family and supported each other throughout the past 14 years. The Scott family has always had a passion for motorbikes. This was no doubt cultivated by Denise and Denis before they were tragically killed doing what they enjoyed, riding motorbikes. Glenn&apos;s first bike was a LEM 50cc, a motorbike purchased by his parents when he was only 5 years old. At the age of 6, Glenn had won his first Australian Championship. Over the next 6 years the Scott family would travel throughout Australia, competing in various dirt bike competitions. The passing of Glenn&apos;s parents saw Greg and Candice continue to support Glenn and his dream to be a World Champion. By the time Glenn was 15 he had won a further 42 State titles and 8 Australian titles. Without the support of his family, Glenn would not have had the opportunity to experience such success. Glenn&apos;s success in Australia didn&apos;t go unnoticed when in 2008 he was asked to compete in the 125GP Spanish Championship, with a privateer team called 7C. Glenn travelled back and forth between Spain with his brother Greg for the highly competitive seven round championship. Glenn then found another opportunity with Team Stop and Go Honda in the same championship in 2009, allowing him to live and train in a small town called Sant Fruitos, just outside Barcelona. This year was more successful for Glenn, finishing 16th. From 2010 onwards, we then saw Glenn come back to Australia to compete in the highly competitive Australian championships and also create his own team with his brother Greg, which then saw them take out the 2013 Australian Privateer championship. This was a very proud moment for the whole Scott family. Between the 2012 and 2013 season Glenn was selected to compete in a new TV series called InsureMyRide - The Ultimate Rider, created to give motorcycle racers in Australia a chance to show off their skills and earn a cash prize of $20,000. This show created great exposure for the riders and motorcycling in Australia. Glenn´s drive and skilful ability enabled him to earn the most points over the series, which consisted of 8 challenges, awarding him the title of InsureMyRide - The Ultimate Rider and taking home the cash prize. Glenn&apos;s International racing career hopes were then reignited by Andrew Offer, team owner and manager of AARK Racing. 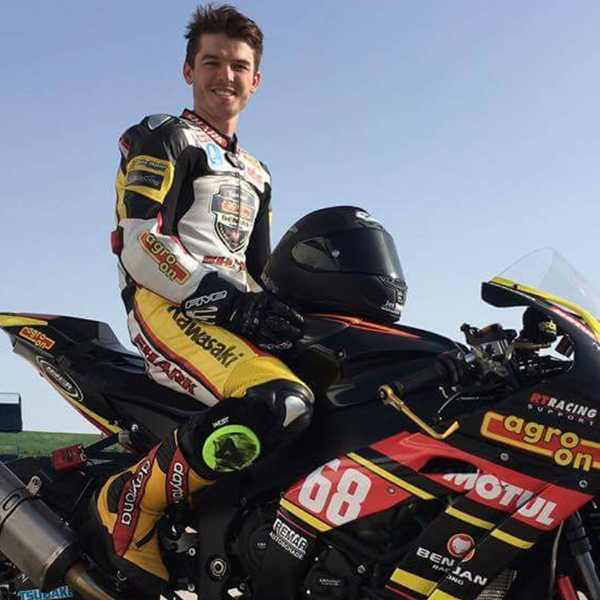 Glenn went on to compete in the 2015 World Supersport Championship for a full season, seeing him live in Spain and travel all over the world to compete in the 13 round championship. This was only the beginning for Glenn&apos;s international racing career. In 2016 he then rode for Italian based team, Lorini Honda, however, a serious leg injury saw him bow out of the season after round 3. Glenns&apos; determination and dream of becoming World Champion did not waiver after his leg injury, it made him stronger and more driven than ever to achieve his goal. Glenn is now riding in the European Superstock 1000 championship for the very professional Dutch team, Agro-on BenJan Kawasaki Racing Team. Glenn is now living and training in the Netherlands with his team and teammates.